A powerful CD DVD burner software to burn data, audios, videos, and images to CDs or DVDs, CD Burner, DVD Burner software all in one ! 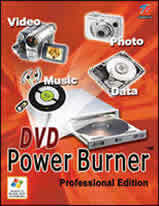 CD DVD Power Burner is leading CD DVD burner software that burns data, audios, videos, and images to CDs or DVDs. Enhanced writing stability increases synchronization and the compatibility with other application programs and software. User-friendly interface and step-by-step wizards make every beginner experience expert's CD DVD burning skills. LESS time and MORE fun! 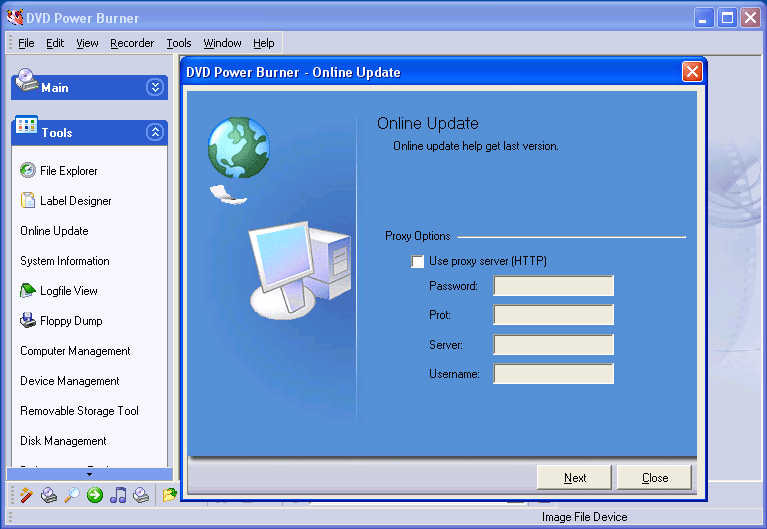 CD DVD Power Burner is also a professional and innovative CD DVD tools and utilities are designed to satisfy your needs. It's more convenient to compose Music CDs than other CD DVD burner software. Forget about any extra CD DVD software for sound track capture, format conversion, or audio compression. Power CD DVD Burner provides one-step solution to make an ideal music album you need. Backup your favorite or important data from computer hard drive for future use. Manage your own digital photos, videos, and songs to make a multimedia CD DVD and play it on your CD DVD player whenever you like. Save data to CD/DVD or make bootable disc easily and quickly with Burning Wizard. Multi-section writing mode makes burning work more flexible. Assign a section to save data automatically or manually. Powerful MP3 Encoder Engine enables it to encode or decode various audio types including CDA, MP3, OGG, APE, and WAF. Users are able to create any kind of CD/DVD image files from source discs and then copy them to other discs later. Support IFO and VOB files to create high quality DVD discs to play on DVD players. Support MPEG1, MPEG2 and DAT formats to create playable video CDs. Directly copy or backup your favorite discs. It is able to copy disc continuously or save them in disc image files. Packet/MRW writing mode saves your data just like write data to HD (hard disc) or FD (floppy disc) with easy drag-and-drops. Support various popular CD/DVD label formats to design individual label with included image library or editing your favorite pictures. Print out your labels using a printer. Help you to erase all kinds of re-writable discs and varieties of data formats. Support multi-recorders to erase data synchronously. DigiMode Ream Sigma - Audio Video Image CD mod and web player. Flash DVD Ripper - Rip DVD VOB to AVI, VOB Files Converter. Fx Movie Joiner - AVI joiner movie MPG MPEG joiner. Fx MPEG Writer - Convert AVI to MPG 1 MPG 2. Fx Joiner Splitter - Super AVI MPEG Joiner and Splitter. Fx Video Converter - Convert WMV AVI Mpeg to AVI Mpeg WMV RM. FrontCam - Capture Screen Motion to AVI Movie files. Firestreamer-DV - Store up to 15 Gigabytes of data to a Mini-DV tape. HT AVI to DVD - Good and easy to use AVI to DVD Converter !